My name is Danni Pomplun. I have been a yoga teacher for almost five years and a student of the practice for about twelve years. When I first started the practice, it was all about the physical benefits for me. I heard what the teachers chatted about in classes I took but I never really listened. Over the past five years, my life has taken some really crazy twists and turns. I’ve lost a partner, my dog, and, most recently, my mother. I battled my own demons with addiction and self-worth. I even reached the end of my rope where I thought I didn’t have a place in this world. While all these experiences were scary and overwhelming at times, there was always one thing that was consistent. That thing was you. All the teachers, students, desk workers, cleaners, and everyone else. You guys taught me words like compassion, self-care, and healing. You helped me to understand the necessity of implementing these behaviors in my life, and, in doing so, gave me a call to action. You held space for me when I was down and lifted me even higher when I was already up. It is for this support that I want to express my appreciation. In all communities, individuals will have their ups and downs. The cool thing about being a part of community is that you don’t have to experiences the highs or lows on your own: you automatically get a group of people to share everything with. 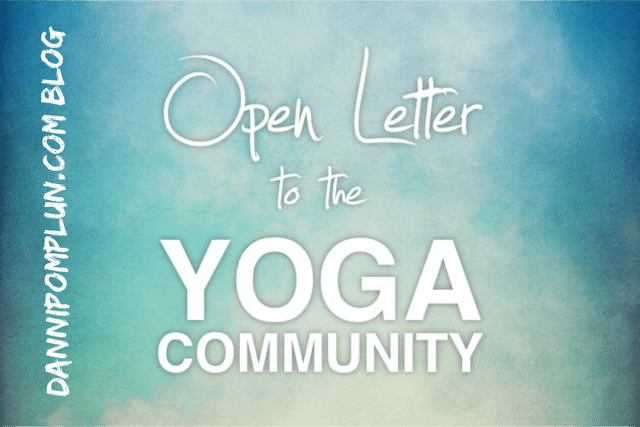 THANK YOU to my yoga community. I will forever be grateful.